Hang out in the jungle with Timon, Pumbaa, Simba, Nala, and Rafiki! Fantastic wall mural from The Lion King. Wouldn't this look magnificent in your room? Take a look at this fantastic wall mural from The Lion King. At 10 1/2-feet wide x 6-feet tall, it's ginormous! 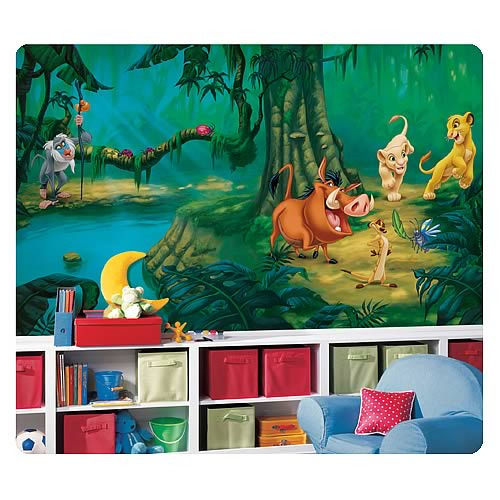 Starring fan-favorite characters Timon, Pumbaa, Simba, Nala, and Rafiki - all hanging out in the jungle - this Lion King Chair Rail Giant Prepasted Wall Mural would look magnificent in the room of any fan of the Lion King movies.